Back to school season has begun! Start off next school year stylish with this 19" Classic Backpack that includes adjustable padded straps, a main zipper compartment that is equipped with an overlapping zipper cover, and a front zipper pocket. This backpack is perfect for students of all ages. Perfect for back-to-school drives or as promotional products; this multi-pack is convenient for businesses or non-profit groups such as charities, churches, schools, or government agencies. Each case comes with 24 backpacks in classic black. Back to school season has begun! Start off next school year stylish with this 19" Classic Backpack that includes adjustable padded straps, a main zipper compartment and a front zipper pocket. This backpack is perfect for students of all ages. Perfect for back-to-school drives or as promotional products; this multi-pack is convenient for businesses or non-profit groups such as charities, churches, schools, or government agencies. Bulk case of 24 backpacks. Our new High Trails 18 Inch Double Zip Backpack is a deal you cannot miss. 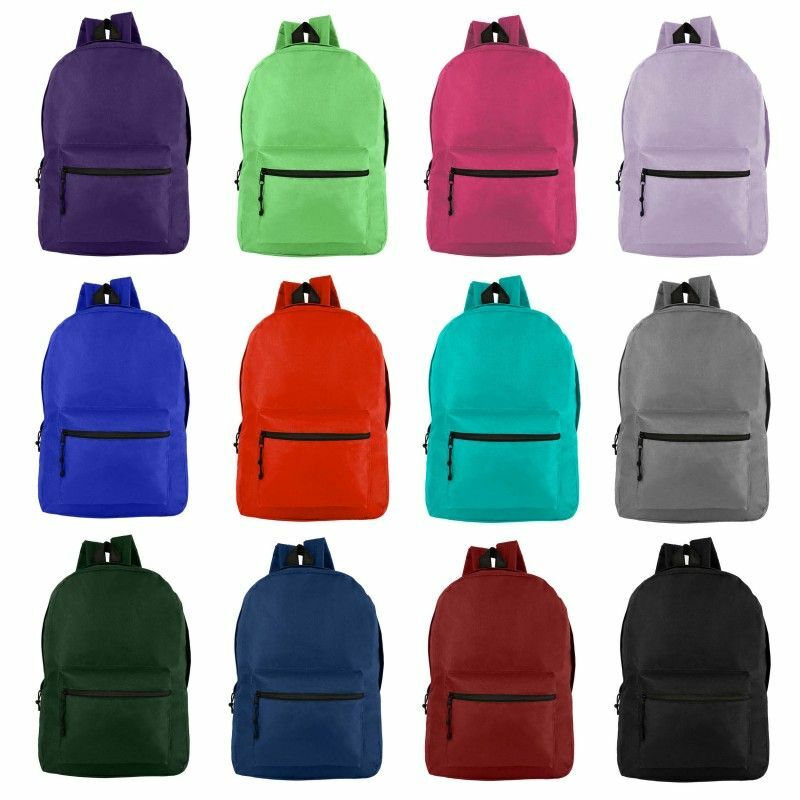 These backpacks comes in modern two tone colors and offer plenty of space for all your school essentials. These backpacks feature our new front double zippered accessory pocket. Which means your items will always be at reach. Our Trailmaker Deluxe 19 Inch Backpack for girls measures 19 x 13 x 7 and are available in fun and vibrant colors that are sure to make a statement! With two mesh side pockets and two additional quick access storage pockets, you can easily carry beverages, school supplies, and any other personal belongings. The large zippered compartments have double zippers making for easily opening and transporting your supplies.